Why do we think Bob Holness was the Baker Street saxophonist? As the nation mourns the sad passing of singer Gerry Rafferty, the myth involving his famous song Baker Street and a certain quiz show host has received a fresh airing. So how, asks the Magazine, did it come about? Mention Gerry Rafferty's Baker Street and it's not long before someone pipes up with the classic "Did you know…" associated with the song. 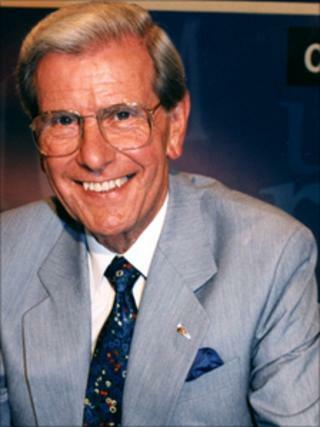 The story goes that quiz show host Bob Holness, a radio and television presenter known to millions for his 12 years on ITV's Blockbusters, played the saxophone solo that defined the track. It's not true, of course. The real saxophonist was a Scottish musician named Raphael Ravenscroft. So firmly is this untruth embedded in people's minds that in Twitter discussions following Rafferty's death, it was Holness's name that came up time and again, although sometimes in a very knowing way. It is thought the myth first appeared as a blatant spoof in the Believe It Or Not column in NME's Thrills page, in 1990. Music writer Stuart Maconie, who was once NME's assistant editor, has claimed responsibility. "My personal and silly part in a sad story is that as an NME writer I invented the urban myth claiming that Bob played the sax solo on Gerry's 1978 hit Baker Street," he said, writing this week. "That's not true. What is, is that Gerry's enigmatic, wry songcraft and his way with a nagging melody made him a reluctant star in successive eras of 70s pop. "But most famously his single Baker Street was a worldwide hit - helped by his melancholic delivery and that unforgettable sax line, played not by Blockbusters host Bob but Raphael Ravenscroft." But Maconie may not provide the whole story. Tommy Boyd has also said he was the first to make the connection, years before Maconie, while a DJ on London's LBC, looking for false stories for a quiz. "The idea of someone as neat and tidy as Bob being able to swing out a raunchy sax came easily, and I ran 'True or false: Bob Holness played sax on Gerry Rafferty's Baker Street?' for one night." And Ravenscroft himself also says he came up with the idea. He told the Magazine: "I made that up because I used to be asked 20 or 30 times if I was the person who did it, so to a foreign journalist I said it was Bob Holness, because I had been working with him on a Robinson's advert. It was just a bit of fun." Whatever the exact genesis, the story gained momentum and Holness was often questioned about it. Years later, he said: "I would have loved to have been responsible for that tremendous sax solo but I can't play a note." It's one of those pop legends that has been repeated many times, says Simon Warner, lecturer in popular music studies at the University of Leeds. The saxophone solo was so ubiquitous in the late 70s that it was fertile ground for this kind of fanciful tale, says Neil McCormick, rock critic on the Daily Telegraph. "It probably took hold because it was so ludicrous that people would repeat it as a fact. "When you're a kid and someone tells you something , then 20 years later you realise that they were lying, and your dad wasn't actually a cowboy, just as the words leave your mouth." "It used to pop up in pub quizzes and pub conversations - was Bob Holness the man who played the sax or not? "I remember Baker Street being out and the sax solo had quite a memorable quality to it. The riff left its mark on pop fans. It was a hit and everyone knew the line, so when this rumour was put around, people took an interest. "Blockbusters was beginning to make an impression at the time so there was this double level of popular cultural exposure, through the music and the TV programme. It's so absurd that it had a ring of truth to it." But beware from discounting all fanciful facts involving Bob Holness. He was the second actor to portray James Bond, starring in a radio adaptation of Moonraker in 1956.